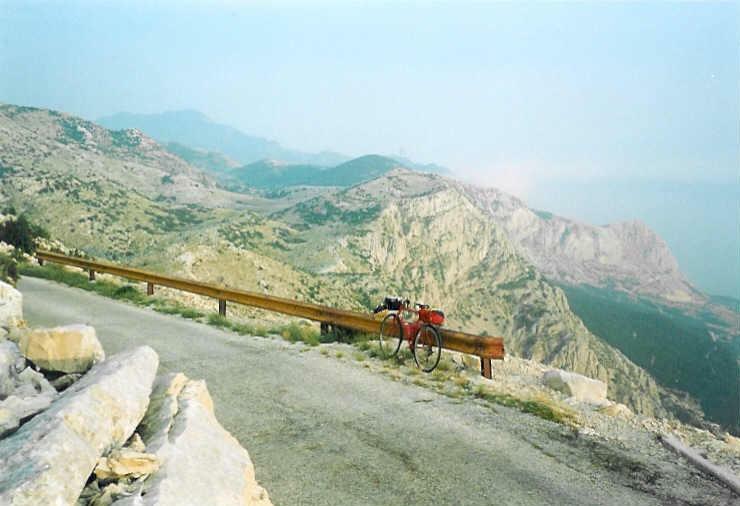 After experiences in cycle-touring abroad gathered 6-8 year long, for this (2003) summer I preferred to cycle along the Adria next to the mountains than to push the pedals on the ascents of the Alps (I did it in 2001). Year by year I like more and more those places where I can enjoy both the beauty of the mountains and the clear lake or sea. Croatia and Montengro are such places. I knew that bicycling along the Adria to Dubrovnik would took me about 7-9 days, but besides (emellett) I wanted to visit a few islands. I thought if I reach Dubrovnik - this wonderful town, only one day trip from the Gulf of Kotor - I would have to cycle there to. About Montenegro I read and saw beautiful photos on the website of www.baraka.hu and and On the website of baraka there were useful informations about travelling to Montenegro and their programtips gave me good ideas where to bike. I could fit in the more than 2 week, less than 3 week long holiday only if I had reached Ljubljana by train and had planned to travel to home from there by train too. (This way was shorter by one day than biking to the sea from Zagreb) Besides I purchased a ticket for a ship between Dubrovnik and Rijeka. After 8 hour long travelling by train I arrived at Ljubljana at 10.30 pm. I biked to the camping on the well built and good conditioned cycle roads. My late arrival wasnt a problem, because the camp is - I think - non stop and I had sent an email the day before. As I wished, I woke up for a beautiful morning. I felt again the feeling of the first morning of bicycletours with pack: far away from the people I love, but before a big tour. To the center I biked on the bikeroad between people who were cycling to work. After a little bit walking and making film I had breakfast next to the main square. I experienced again that the prices were a little bit higher than at home. The few bridges above the small river and the promenades along the river were atmospheric. The road towards Kocevje ascended from step to step. I arrived to between the mountains which were like the true alpine mountains. After Kocevje I was waiting for the area next to Delnice and the Risnjak National Park. I like this land since I first biked there in 1999. After Banjaloka (not Banja Luka in Bosnia) looking through the trees I could suspect the deep, romantic and rocky valley. The border station was built at the bridge of the river. My first croatian biking kilometers started with a somewhere 10% steep ascent. I hardly met any car. The calm, undisturbed climb in the forest was just like in Slovakia. From Delnice I was cycling through beautiful land and fir tree forests I had already known. I spent a little time to visit the Lake Lokve (I gave this name to the lake), although I knew that after about 2-3 km ascent I would get a beautiful view to the lake downwards. I waited for meeting again the 881m high Gornje Jelenje pass, from where I could get the first picture to the Adriatic. This time  because of the sun from the west  the view wasnt so good like in 1999, in the morning. After a pleasant slope I arrived at Rijeka at about 7 pm. 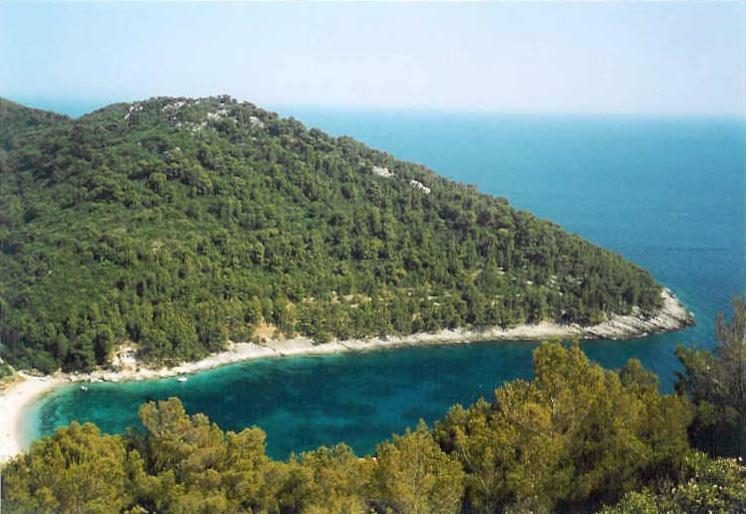 I found a good camp 10 kms before the place I planned, not far away from the bridge to the island Krk. 5th June: Kraljevica  Krk  Vrbnik  Crkvenica - camping after Kozica = 121 km + 1150 m heightdiff. On the beautiful bridge with its large span I biked onto the island for free. The cars had to pay for the bridge-use. My first lay-by went to a small village, Omisalj which had a friendly castle on a big rock. 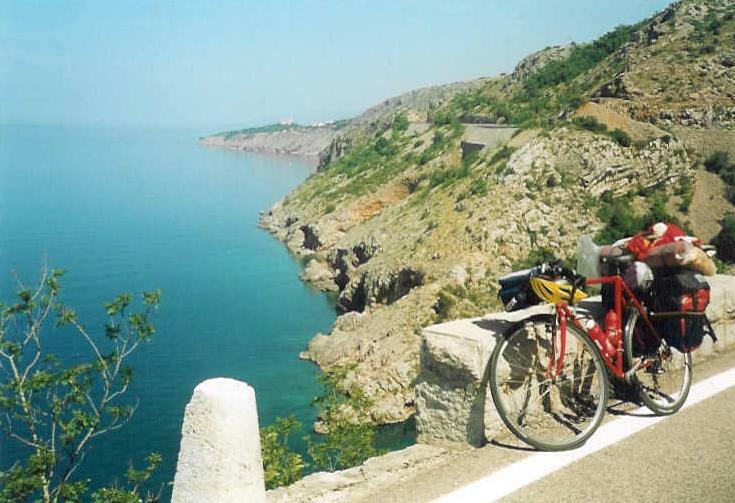 Rolling down to the rocky shore of the Adriatic I pushed the pedals slowly and enjoyed the clear, blue and green water. Backwards I had to struggle on the 15% steep climb. The roads on the island usually went mainly between brushwoods. There were more bushes than trees. The road was hilly: the 1-2 km long ascents and descents changed each other. Krk was the place where I realized first that the heatwave had come. On this island I experienced the atmosphere of the southern lands, areas: there were a lot of flowers, palm trees, houses built by large stones, the old pedestrian streets, some bench in the promenade, etc. To arrive to Vrbnik first I had to go up on a steep, sunny climb: the village was built onto the rocks at the shore of the Adriatic. Next to chapel there was a beautiful view to the sea, the village and the mountains behind the sea. Going out from the island I got a bad surprise: Policemen stopped the traffic, because of the landing of the popes plane. I could go on cycling only after one and a half hour. Connecting back to the road going along the Adriatic I could cycle on flat road again. It was tiring to bicycle on the hilly roads of Krk. The camp after Kozica  in the first week of june  was nearly empty. There was only one tent besides me But that was why I could enjoy so much the nearness of the sea. The water was rippling only 10 meters from my tent. 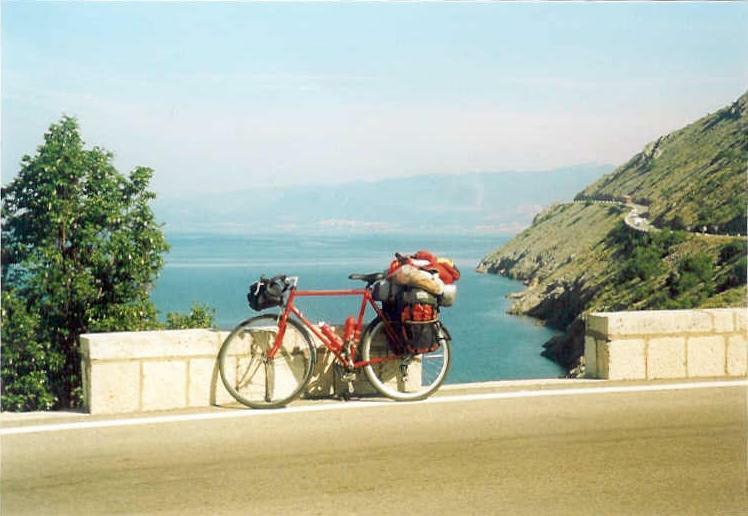 6th June: Kozica  Senj  Starigrad  Paklenica  Zadar  Bibinje = 180 km + 1000 m heightdiff. After waking up, I went to the rocky shore. I was very happy: the shore was fantastic with its calmness, with the yellow flowers, morning lights, the rocks of the island Krk in the opposite and with the clear water, which was transparent until the deepness of 3-4meters. 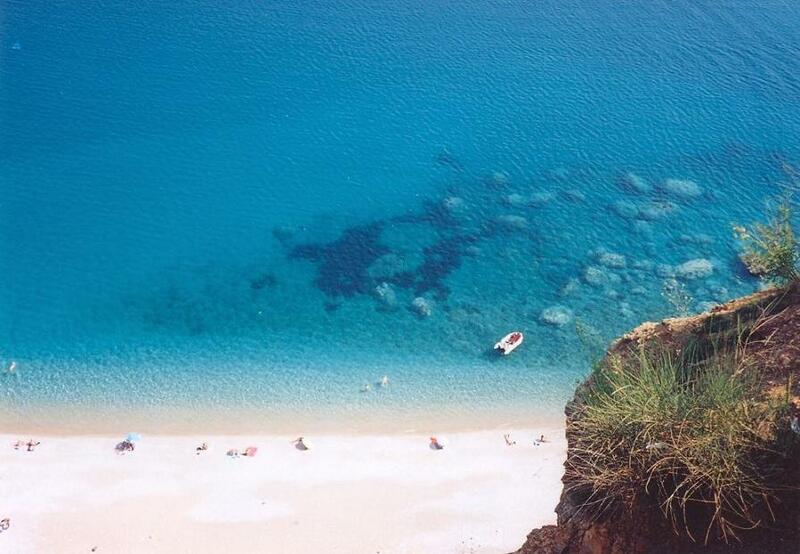 One of the most beautiful part of the Adriatic waited for me. I had already read it in the guide. 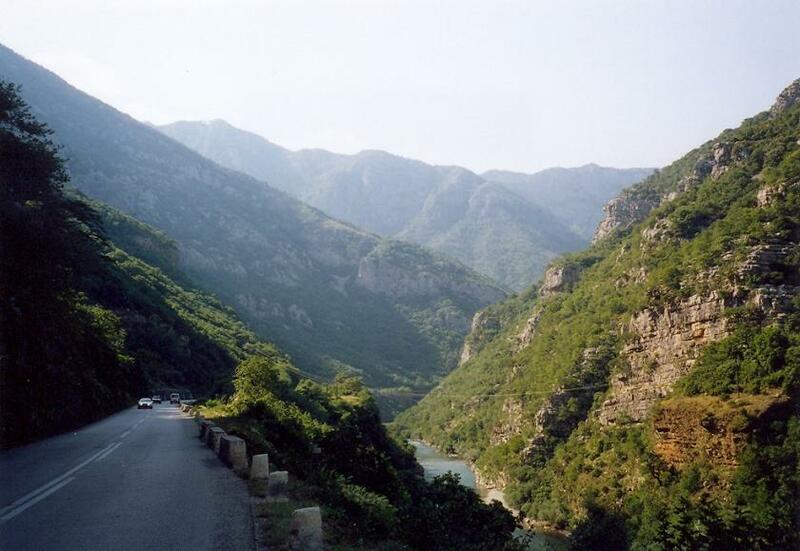 To Senj the road was twisting on the rocky mountainside next to the water (1st photo). After the little town the road ascended average on the bare mountainside through rocks, yellow grass and brushwoods. This few vegetation was the reason why the road was continuously panoramic. From the 65 km long section to Karlobag I remembered the Route 66 from american films, where there are petrol stations or buildings only in every 1-200 kms. There was everywhere grass, brushwoods, rocks and hot sunshine, but only after about every 10 km could I found a house, biulding, where I could get water. After Karlobag I was pushing the pedals on the shore of the sea; the land - with the green or blue watered, romatic, rocky creeks  was fantastic again. In some of them a yacht was swinging on the sea. Athough there is a nice National Park in Starigrad Paklenica, I had to go on cycling. After turning towards Zadar I had to climb up to the viaduct of the highway that was under construction. Leaving the mountains I had to cross small hills. In the center of the town there was pleasant atmosphere with tourists, music, and lights. From the shore I could see the lights of the Ugljan island. I tried to sleep in the camp south from Zadar, but after 9 pm. I got to know that the camp is closed. At last I found a small familiar camp in Bibinje. Last evening I cycled to Zadar to see if it was worth going back in the morning. It was. The center was being made itself for the Pope visit on the following days. A wooden stage was being built and some building were under cleaning. In the next 73 kms I was pushing the pedals far away from the mountains, but at the feet of a hillrow at the beach. The land wasnt rocky, rather sandy. Biograd was a nice, ordered, friendly town with flowers, park and palm trees and promenade on the beach. Between Pirovac and the creek next to Sibenik I had to say goodbye to the sea for an hour. I didnt enjoyed the heatwave, I often had to fill the flask again. Reaching the bridge over the creek, the view towards Sibenik compensated me for the last hour sweating and cycling in the hot. From the edge of Sibenik I was cycling on a hilly and bare land to the entrance of the Krka National Park. In the parking place young guys and girls welcame and helped the people. They could speak english. At the cashier I got not only a hungarian prospectus but when I paid for it, the girl said thanks in hungarian. As I read on the net from Hungary some weeks ago I could go in by bike and could roll down to the riverbank. The entrance fee was 50 Kn. I could leave my bike there, because an employee of a Park was there, so she could look after my bicycle. I made a nice and pleasant walk in the humid forest, above the plashing water and between the waterfalls. There were well built wooden bridges there. Although I didnt go on shipping on the river and didnt make a longer walk, I felt that it was worth buying the ticket only because of this walk around and through that waterfall system. Although the cathedral of Sibenik is the part of the UNESCO World Heritages, the town itself wasnt busy, but I could see the end of a croatian wedding. That was a good decision to sleep in Primosten, because in the morning - when I went to shop - I could feel the atmosphere and see the beauty of this lovely village. The village was built onto a small peninsula. The sea around it was green or blue everywhere. After leaving I was cycling in hilly area; it was strange not to see the sea for an hour. After Marina the road was going along the Adriatic. 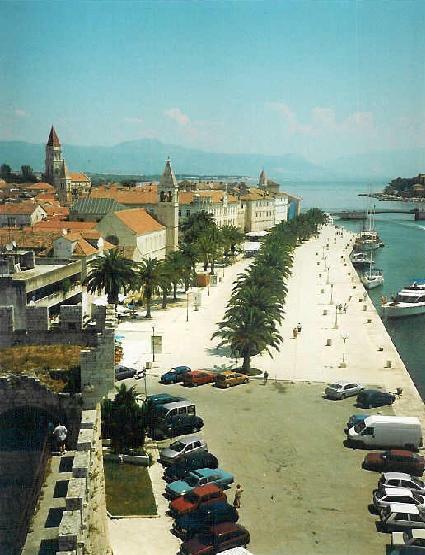 Trogir was a fantastic town (photo), thats why it is also part of the UNESCO World Heritages. I decided to cancel to visit the island Hvar on the following day, so I could enjoy the atmosphere, the stone-houses, promenades, plam trees, flowers of the town. I didnt have to hurry. After stepping up to the tower at the end of the promenade, I got a panorama to the whole center and the mountains behind it. In a yard of an ice-bar I ate fantastic delicious ice. Not only the ice itself was good, but there were a lot of fruits in it: sour cherry, orange, banana, apple, kiwi, plum, pineapple. I arrived at Split from the uglier direction: there were some stores, factories and chimneys. After climbig the hill I could roll down to the port and to the center next to it. I bought a ticket for an earlier ship to leave to the island Brac. Besides the ticket I got an information-paper about the schedule of the ships in the region. I remainded about an hour to see the old walls, buildings in the Diocletianus palace. It is also the part of the UNESCO World Heritages. During my walk there it was interesting to think that more than 2000 years before people had lived there and had spoken, bought, worked there and they built that buildings. The darker stones, wallparts were the Roman. After my first ship-trip on the sea I arrived at Brac island. The ticket costed 41 KN. In the village Supertar I enjoyed the atmosphere, the promenade and the park around the jacht-port very much. There were some tourists, but the village wasnt busy. IN the camp - at the dge of the village - I had an hour long talk with an american bicycler pair. I woke up for such a day, about that I knew that in the afternoon I would swim in the sea for the first time that year. I planned to visit the famous shore of Bol, the Zlatni Rat (golden shore / bay). The lower part of the climb went through a forest, but after some kilometers I had to push the pedals under the sun. After cycling some kilometers on the dry plateau I was rolling down on the side of the nearly bare mountain. There were only a few trees or bushes, so I could countinuously enjoy the view to the sea, to the small islands and to the Zlatni Rat (photo). The famous shore could be reached by foot through a forest, but that was only a 2 minute walk. The Zlatni rat is a small peninsula, which shape could be changed by the sea. On the north side of it there were about a meter high waves, but after crossing the ca. 20 m wide peninsula I could enjoy swimming in the calm sea with only 30-40 cm high waves. On that side there wasnt too much wind. A few hungarian guy were doing a new sport art: they combined the waterski with a small parachute. Thanks for the parachute and the wind sometimes they could fly in the air for some moments. Backwards on the other side of the island I chose an other road: I was cycling not too far from the shore: between Postira and Pucisca there were a lot of climb and slopes. After the tour, in the late afternoon I decided to ship back to Split and to sleep close to the town. I thought, on the following day I would be able to cycle more, only if I start my day there, than I start my day with a shiptrip. 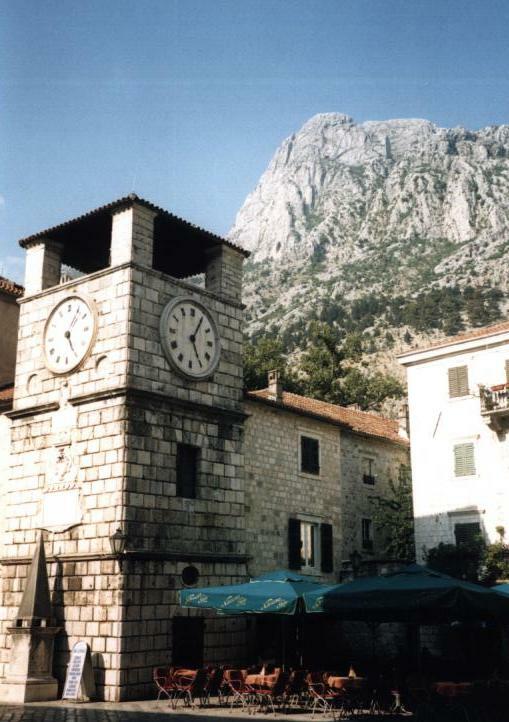 10th June: Split  Omis  Makarska  Sveti Jure emelkedő  Basko Polje = 127 km + 2088m heightdiff. Towards Split I had to follow the tables Split for days. It was a good feeling to follow the Dubrovnik tables then. In Omis it is worth cycling 1-1 km along the river Cetina, as it goes to between the high rockwalls. After the town the road goes along the feet of the 1800m high Biokovo mountain-range. It was interesting to meet trees again, I could enjoy the shade again. In the morning I was happy to cycle trough nice, small, atmospheric seasided villages, then the road climbed onto the side of the bare mountain: I couldnt meet any houses. Before Brela at a crossing I got a view to a beautiful creek with green and turquoise sea deep downwards. A table welcomed me in the Riviera Makarska. I had read only nice things about Makarska, but because of the fact, that I couldnt find any camp nearby and the tourist office told me that the closest is 8 kms from there, I cycled away angry. Although the camp of Basko Polje is large and a little bit busy, it was a good camp with shops, and bakery inside it. On the shore of the camp the stones are sharp. After swimming I started to climb the 1762m high Sveti Jure, the highest point of the Biokovo mountains. There were two things why I wanted to cycle up there: I liked to see down to the sea from a such high point and the other was, how the road went up. On the intenet I saw a photo about a bend: behind the road there was deepness, on the other side a high rockwall. It seemed that the road was going up on the steep side of the rocky mountain. I gave a name for this hairpin: bend of the death. After the village Tucepi I was looking at the rockwall curiously: where does the road go up ? I hardly turned left to the road of the National Park, it started raining. I had to search a roof or tree to hide myself. At last I found one in the village 2 kms downwards. After the thunder I decided to go back to the climb. I enjoyed the steaming road in the forest very much. After the height of about 600m the road became steeper and with the fewer trees I had much more views downwards to the sea and Makarska. Cycling before and after the bend of the death I preferred to cycle in the middle of the road and not on the edge. At a 897m high situated tourist-house I finished biking on the steep rockwall. In the following kilometers the route was hilly but then the road was going on a side of a bare mountain. At half past 7, at a 1228m high parking place and viewpoint I decided to turn back. Downwards I had to be careful: on this slope one can be killed if he is daring. Thats why I was rolling down at the speed of only 30-35 km/h. I felt my hands aching so much, than never before. It was because of the serious braking. I started my morning in Makarska with looking around. I was only walking along the shore in the center, but it really was worth coming back: the promenade was full of flowers, banks, palmtrees, nice houses and rocky mountains behind them. I continued cycling through small holiday-villages. A left the Biokovo mountain-ranges after Gradac. I decided not to cycle around a 40 km long gulf, so I cycled to the ship to cross the gulf. Before the town Ploce it was interesting to see a fresh watered green lake. After two ship-trip I knew that I didnt have to arrive at the port half an hour before the departure, but at last I had to hurry. To the peninsula I arrived at Trpanj, which was a lovely, nice village. From the village I was pushing the pedals on a sunny climb which was followed by strange plants. From the ca. 450m high saddle I was rolling down to Orebic on a slope that was similar to the slope in Brac: almost bare mountainside with views to the sea and the small islands and Korcula. I fineshed the day with swimming in the sea and with a light cycling and looking around in the town. 12th June: Orebic  Korcula  Blato  Vela Luka  Blato  Prizba  Korcula  Orebic  Trpanj = 133 km + 1700 m heightdiff. After an early wake up I crossed the channel by the ferry started at 7.30 am. The travel was about 15 minutes long. In the town there were a lot of tourists, but it was much fewer than two weeks later, when I was there by the ship. Korcula is a tipical historic monumental town with nice houses and the castle built of stones, with flowers, plam trees, the museum of Marco Polo and with views to the sea. Already at 9-10 am the air was warm, but on the sunny ascents it was more hotter, so after some years I let me take off my jersey. I climbed the ascent halfnaked. The ascent was surprisingly followed by trees; Korcula is said to have more plants, richer vegetation than the others islands. I had to climb up to the height of 400m, from where there was a view sometimes towards southeast or west. During rolling down from the mountain on the steep side of a deep valley I immediately felt as I went into the hot air; just like in the sauna. It seemed that it wasnt accidentaly that during the day I sometimes saw burnt down forests, trees or tables that prohibitted to make a fire. The small town or village Blatno surprised me with its 2 km long, shady, cool main street. From the town to Vela Luka the road was flat or gently descending. 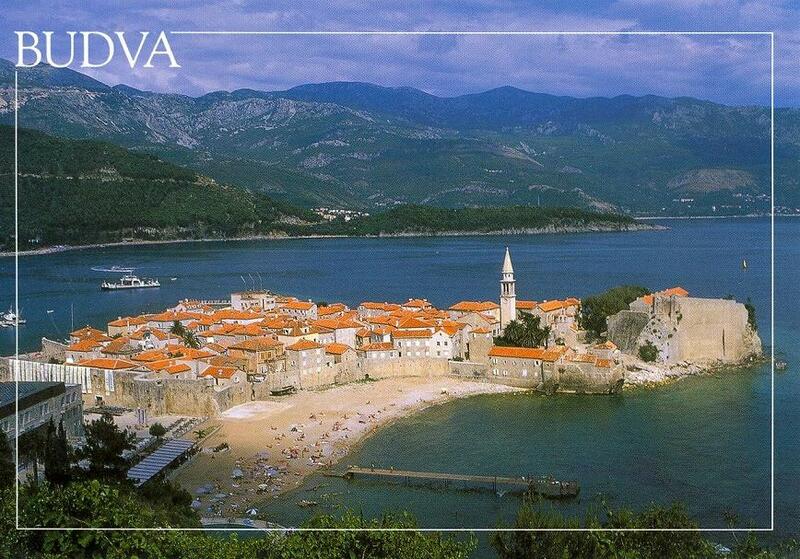 Vela Luka was not much than a friendly fishing-village. Backwards, after Blatno I chose the beautiful panoramic road that went along the rocky, southern side of Korcula, next to the Adriatic-shore. It was no accident, that there were a lot of holidayhouses there, because I often saw calm shores with clear seawater, and green fir trees. After Smovica I found one of the most beautiful place of my 20 day long tour. From the very bumpy but little trafficked road I got a view to Popnatska Luka. The creek was surrounded by a fir tree forest, the color of the water was somewhere green, elsewhere blue or turquoise. How long can it remain so calm? From Pupnat I quickly arrived at Korcula, then to Orebic by ferry. After I fastly took down my tent, with 120kms in my legs I started to climb the mountain of the island to be able to sleep on the other side of the island, from where I would be able to cross the gulf in the morning. It was fortune that on some parts of the ascent the wind was blowing from the back. I could feel its help. The campsite of Trpanj was a nice surprise for me: although there were a lot of German there and I had to pay in EUR (only 5 for a night), but the camp was ordered, modern and full of flowers and palm trees. The germans in front of my tent were so friendly that in the evening they offered my a camp-chair, in the morning they offered me tea or milk. 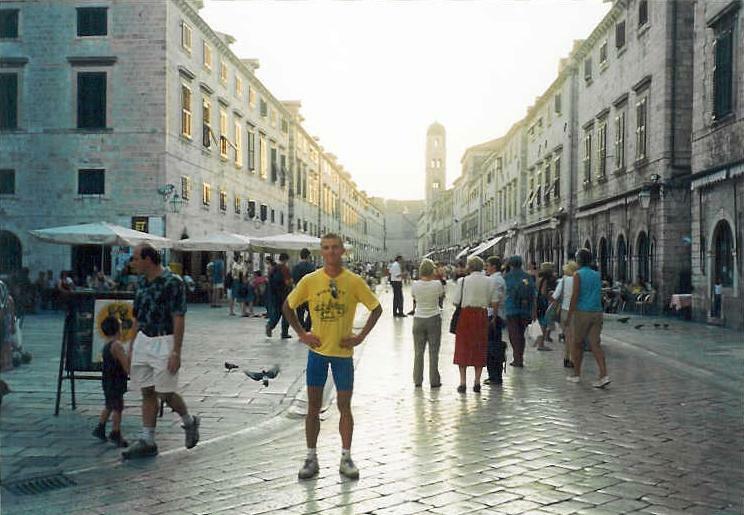 13rd June: Trpanj  Ploce  Ston  Dubrovnik  Srebreno = 117 km + 800 m heightdiff. My ferry left the Peljesac peninsula at 9 am. From Ploce I was biking on a flat road to the bridge that crossed the river Neretva. 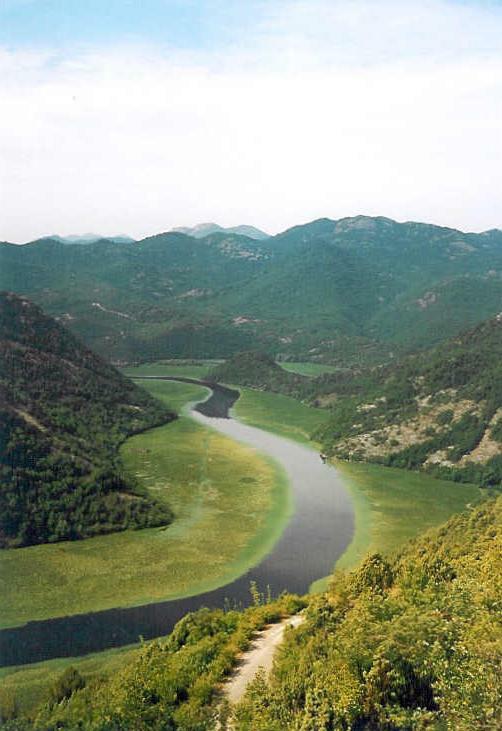 When some years before I had heard about the Neretva valley it remained in my mind as a valley that is far from Hungary in south Croatia and Bosnia. That time I felt well, that I reached it by bike. The mouth of river is a 20km long and wide flat area between and in front of the mountains with a lot of green vegetation. After I finished taking videofilm from the bridge I had a good idea: from my flask I poured cold water onto my T-shirt. After I put it on me I felt much better in the heatwave, than before. It cooled me for a quarter an hour. About the Ston channel (photo)with small islands in it I first saw a picture in a prospect, that I had taken with me from the Travel exhibition in spring. That time I fell in love with it and planned to visit it in every case. It was really just like on the pictures. But I had a difficulty: for an hour long I couldnt find something where I could get water or drink. I could only see the Adriatic and the fantastic landscape. At a petrol station in a half an hour time I drank one and a half liter liquid. The temperature was about 35 degrees. I was cycling in Bosnia Hercegovina for about a half an hour. That was the first time that I was in that country. Because the country has only one village / town on the beach, the town Neum seemed somewhere a little bit luxurious. On the last 40 km long section before Dubrovnik I saw a lot of beautiful creeks with green or turquoise water, but I couldnt get bored with it. The mountains were barer than before, but because of this I could continuously enjoy the view. I get the first sight of Dubrovnik 20 kms before the town. I enjoyed very much that in south Croatia more and more drivers welcomed me with horn. It was a pleasure to get sight of Dubrovnik from a short distance (photo): on the left side 50 m above the sea the viaduct, next to it a huge liner, than the bay and the port with houses at the shore of it, and on the right side a small peninsula with green trees. I arrived at the center  that in listed between the UNESCO World heritages  from the hill that separated the center from the other part. The view to the fortress and the walls, and bastions of it was beautiful. I had already seen pictures about the main square, but it was interesting to realize that the stones (pavement) of the square are shining not because of the rain, but because it became shabby during the centuries. The main square was atmospheric : every house was built of stones, there are shutters at the windows and the square was full of tourists. There were a lot of shops, ice-shops, restaurants. As the time went by at about 7 pm the sun was just shining through the window of the tower of the church. During taking photos it was a pleasure to meet a hungarian pair, with whom I talked and changed experiences for about half an hour long. When I left the center I ran into two english guy, who had just finished their bicycletour through the croatian islands. WE spoke about our tours for about 20 minutes. It was not simple to get out from the center to the main road towards Cavtat. First I was biking slowly in a street in which the cars could come opposine of me, then at the end of it I asked a man, where I could go on. He offered me the small road on the side of the steep mountainside. It seemed that some decades ago it could had been the main road, but that time it was only a walking route for pairs, for motordrivers or cyclists. From the lower section I had views to the center of Dubrovnik, then to the sea. I found a nice campsite in Srebreno, 8 kms after Dubrovnik. The warehouse was next to the camp, so I could buy everything for my supper. During the talk with the receptionist I got to know that such a warm weather is very rare there; normally in the middle of june the temperature should have been maximum 30 degrees centigrade. 14th June: Srebreno  Hercegnovi (Montenegro)  Kotor  Tivat = 107 km + 270 m heightdiff. Last afternoon I was looking around in the center of Dubrovnik but it was a general walk. I thought that on the last day before the ship-route I would have time to look around in Dubrovnik, so this (14 th june) morning I decided not to cycle back. Montenegro waited for me! After Cavtat I said goodbye to the sea for the next hour. Next to the airport I got serious facewind. (I chose the direction of tour well, because during the kilometers I left I hardly had any facewind.) Because of the facewind and the very hot weather I wasnt happy. When I wanted to cool my body with a little pleasant cold water, the water that ran out of my flask was lukewarm. I had about 33-35 degree warm weather for more than a week. At the border I didnt have any problem; I cant remember if I asked for it, but in any case I got a stamp into my passport. In Montenegro the road surface was good, but a little bit worse than in Croatia: I wasnt happy because of the thin repairing that crossed the road. I turned off to Hercegnovi but it seemed to be az average holiday-resort, but its true that I couldnt find neither the castle nor the center. After that the road along the croatian Adria was mainly hilly, it was a pleasant surprise that the 40 km long road around the Gulf of Kotor was totally flat. There were only one or two short ascents. (Usually I prefer to the roads with long ascents and not the hilly roads.) Because of the hot weather I could hardly enjoy cycling in such a beautiful area (it is listed between the UNESCO World Heritages), but after I dipped my jersey into the sea it was much better. The Gulf of Kotor reminded me of the Lake Lugano or Locarno (Switzerland) where there are also high mountains around the lake. The area, land was here barer, although at the shore there were flowers (photo). The mountains were rocky and there were not too many plants on it. In Montenegro the roads were not so busy than in south Croatia. In the Gulf of Kotor I met with a few cars, I think it was because that the cars chose the ferry before the gulf. It was a good feeling that I could reach the Gulf of Kotor by bike. I had waited for this moment for months. 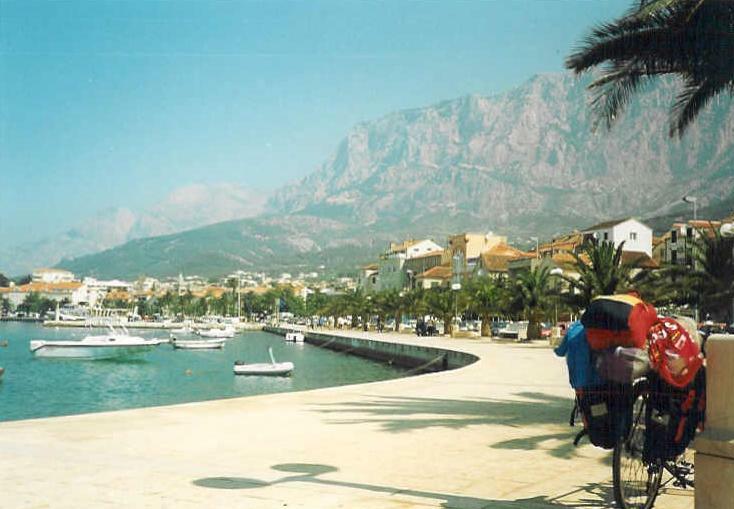 In the calm and quiet villages there were palmtrees, flowers, blue and green seawater and the steep rocky mountains. In Lugano and Locarno (Switzerland) I could enjoy the busy life, here I could enjoy the peace. Perast (photo)had a very pleasant atmosphere; fortunately it hadnt been discovered by the foreign tourists. It was a quiet village, maybe fishing-village. Here I could see how they live. Arriving at Kotor the peace in the center surprised me; I could hardly see any tourists. It was Sunday. There were some clothes-shops, souvenir-shops, cafés, confectioners but there were only a few people. At first I thought that I would experience it everywhere in Montenegro, because the war some years ago, but next day I realized that Budva had a busy life. In Kotor it was interesting how steep the rocks go up next to the church, cathedral (photo). Almost in every direction I saw high mountains behind the buildings. Above Kotor there are two castles. Through a tunnel I cycled to Tivat , where I could find a quiet and small camping at the end of the town. It was a nice surprise to met with a hungarian family. And the prices of the camping ? The hungarian family said to me that they had to pay 5 euros for a tent, a car and for four people for a night. I paid 2 euros. It was like a joke. Because of the mountains around the gulf the sun was going down early in the evening before it I swam a good in the sea. 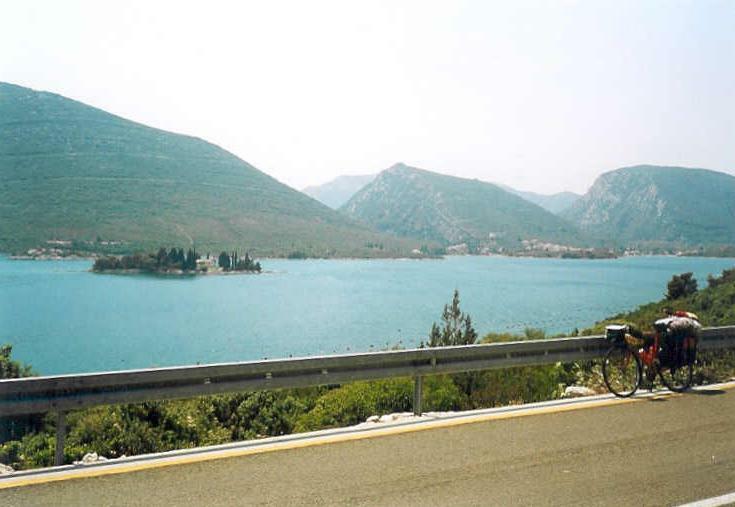 15th June: Tivat  Kotor  the pass between Kotor and Cetinje (1006m) Kotor  Tivat  Budva = 108 km + 1316 m heightdiff. I spoke with the owner of the camping that it wouldnt be problem if with a start in the morning I took a cycletour on the side of the 1749m high Locven. I planned to arrive at the camp about 1-2 pm. In Hungary I found some pictures and some sentences about the road, so I knew that the top can be reached by bike. Some days ago because of a rain and the evening I could cycle up only to the height of 1228m on the Sveti Jure from Makarska. From that time I wanted to cycle up to the Lovcen more than before. But because of the hot days sometimes I preferred to swim in the pleasant sea than to sweat on a climb. In the morning I biked to Kotor on the road around the peninsula. I hardly met any cars. 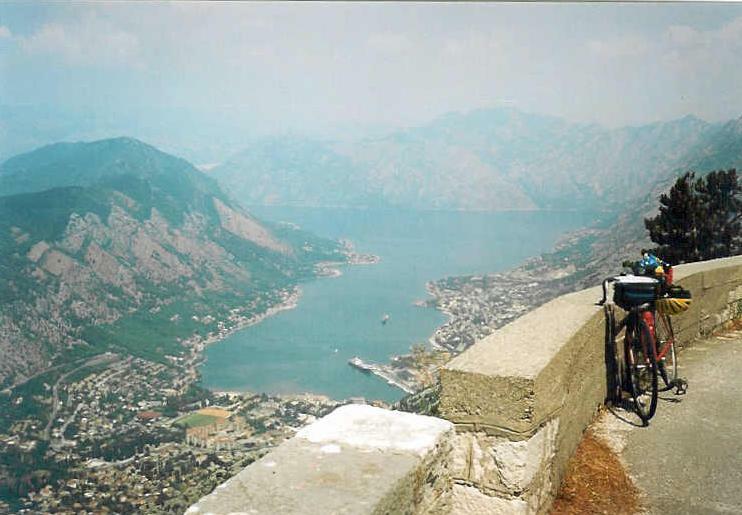 In Kotor I followed my intuition and maybe a table towards the mountain-road. For about 2 kms I was pushing the pedals on a light trafficked road, but its surface wasnt good enough to be the road to Cetinje, that was a important town of Montenegro some years before. I think some years ago that could be the used road, but then (in 2003) there was a main road on the side of the opposite mountain. This road - which was going up under the Lovcen - was ideal for the bikers. I connected into the main road at the height about 150m. There were some serpentinbends, I often stopped for a photo or videofilm towards the Gurf, the town and the mountains. I thought I would have warm on the climb but it surprised me. After turning off from the main road, the mountain road  on which I hardly met any cars  was twisting up on the west side of the Lovcen. The mountain going above me saved me from the sunshine and there were a lot of trees also, which was a surprise too. Because of these and because of the light ascent this was an ideal climb for bikers. It was not too serious, not too warm, but it let pleasant cycling with a lot of beautiful views to the Gulf and the area and to the bends. Looking at downwards sometimes I could see 2-3 bends and 5-6 straight roads of the hairpins. I measured the height where I was to the height of the mountain opposite of me. At the end, after about 20 km cycling up I reached the 1006m high pass. On the other side the land was gently sloping with some bushes, grass and a few trees. The mountains were rocky and bare. The view downwards was very humid, and I felt I had enough beautiful pictures and I wanted to swim in that afternoon so I decided to turn back and not to climb up to the Lovcen. Now, some months after it I may be sad about it, but at that time I chose that was better for me. Maybe it was because of the lot of hot days. On the slope I went back into the warm and at sealevel into the hot air. After packing up I biked southwards. I arrived to the beach 6 kms before Budva after a long light ascent and descent. First I could hardly see the table of the Jaz beach camping, but when I get a sight of the camping and the blue-green-turquoise coluored clear sea from the steep ascent towards Budva, I had to turn back. I decided to stay here and not in Budva. From the road about 30 m above the sea I could look at 4-5 m deep into the sea. A saw a man on a mattress but I also could see the bottom of the sea about 4-5 m deeper than him. Arriving at the camping, it surprised me. Some years ago it should have been a good camp with everything the people wanted at that time, but the time could ruin it because the state let it. It remained a free camping. There wasnt any reception, the toilet was dirty enough, a few of them was closed, those showers and taps which were in the camp and not at the beach were closed from the evening to the morning. For the night most of the sellers went away, but some of them spent the night in their caravan or tent. On the beach there were small booths from where icecreams, drinks were sold. The deck-chairs and parasols  which were stand there by an ice-cream company  were free. Because I met there with an other hungarian family I could let my tent alone without any fear. 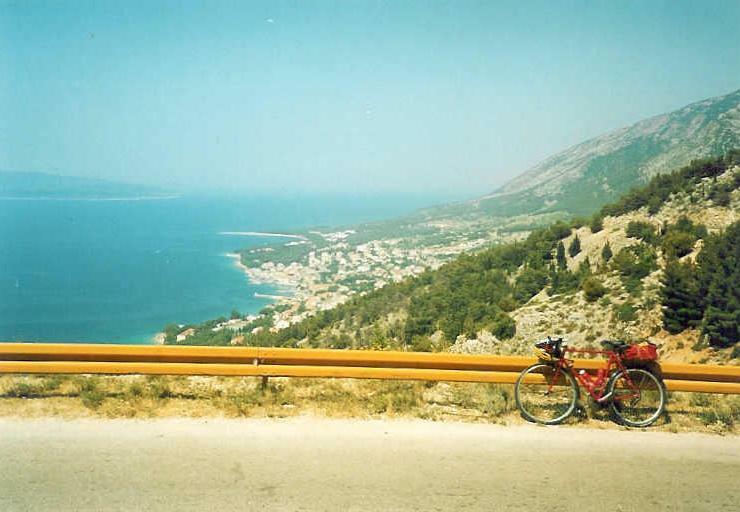 In the early evening I cycled  through some tunnels on the side of the steep rockwall - to the 6 km away situated Budva. I had read about its nice and atmospheric center and the 4-5 km long bazaar-row. The center inside of the castle was busy! There were a lot of shops, restaurants, cafés, sometimes I could hear good music from some shops, restaurants. In the bazaars everything could be bought: bathing-things, souvenirs, music-CDs, clothes, knick-knacks. In the evening somewhere the lamps were lighted and before starting back I met with serbian youngs who was celebrated the victory of the Serbians over Hungary in the European Waterpolo Championchips final. 16th June: Jaz beach  Sveti Stefan  Petrovac  Podgorica  Morava-kanyon  Kolasin = 156 km + 1860 m heightdiff. I had read a lot about the road section after Budva and I could experience it: there were nice rocky gulfs, busy villages, holiday-resorsts, but the most famous: the island of the millionares, which is almost a hotel-island: Sveti Stefan (photo). About 10-20 years ago it was between the 10 best hotels over the world. Just in front of the entrance of the island there was a beautiful park with flowers, cutted grass, palmtrees and one or two sculptures. What I read in the travelbook I could experience too: At first the guards didnt let me in with my bike, then they informed me about that I should have to pay 5 EUR to go in. Because in the last 14 days I had already seen some wonderful, nice and busy villages I decided not to go in. 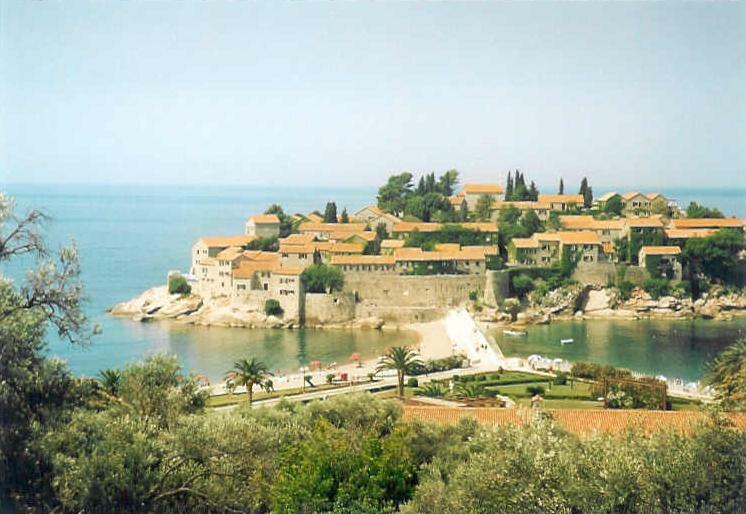 Not much before Sveti Stefan I visited the park and the gulf of Hotel Milocer, I had read about also in the travelbook. The gulf was surrounded by rocks, the sea was clear and there were nice plants too. The gulf is open only for their guests, but can be seen by everybody. Towards Petrovac the road was going on the mountainside, sometimes there were tables that invited me to visit old monasteries. I knew that to reach the 665 m high summit on the top of the mountain-range I had to climb about one hour, so because of the hot weather I had to roll down to Petrovac to buy some food and drink. At the crossing I didnt watch enough the tables so I stopped too late. There was a police-booth there and a policeman came to me with a strict face. In Montenegro we can met with a lot of policemen. The public security is said to be not worse than in Hungary. In this case fortunately I could go away without any payment. On the climb I didnt want to stop to the first tree which gave me shadow. It was about 6-7kms after I left the forest down. On the mountainside there were grass, bushes and somewhere trees, but not close to the road. That road was the E65 and E80 mainroad, so I met with a lot of slow lorries and tracks. It was interesting for me how slow they went up and down; about 40km/h. I didnt know that it was because of the not so good lorries or because of the steepness of the ascent. On the sunny climb there were continuously very good views to the sea and to the shore, beach and the road on that I was pushing the pedals. On the other side of the mountain I could roll down in forests. Turning left there was a great view to the plane arond the capital, Podgirica and then to the Lake Skadar, which is a National park because of its fauna and flora. On the last sloping kilometers I had some exciting moments. First I saw that some cars stopped and made a row, then I saw, why. On the other lane a car was burning ! The flames was about 3-4 m high, and minutes later the tree next to it were also burning. I didnt know if it had caught fire because of the hot air or other thing. After some minutes I started pushing the pedals with a little fear and hurryed away in the outer side of my lane. The air next to the car was truly warm, but I didnt want to wait too much and without patrol I didnt have to fear. 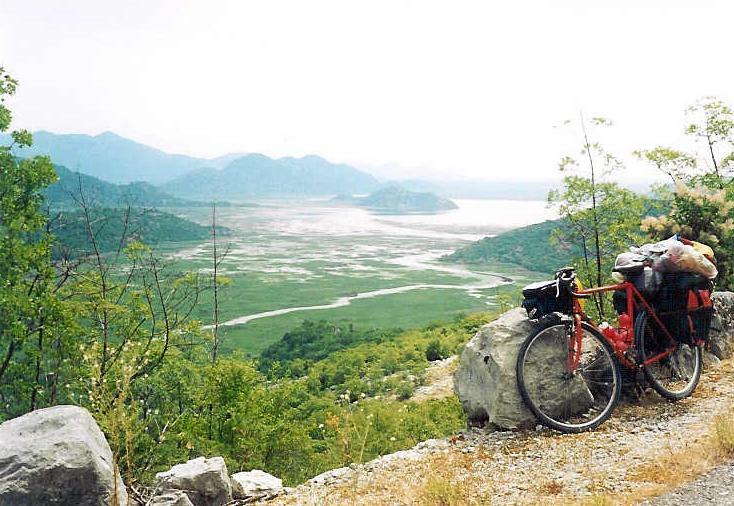 After Virpazar I crossed the lake Skadar on a thin strip of land next to the railway. From Vranjina I was bicycling on a totally flat road towards Podgorica. On the last 10kms I went through villages with more and more shops, sellers. On the main road on which I arrived at the capital I felt like arriving into a socialist city: old welcome and other tables, sometimes houses, not cutted meadows, dirtyness and, a few worthless car and in the center I could see some cube-shaped houses. I couldnt seen any modern petrol stations, warehouses or stores. ON the way where I crossed Podgorica I couldnt see any nice buildings, park, about which I should have to stop, but its true that I prefer the natural beauty to the nice buildings. I was cycling about 30 kms in the gently sloping and wonderful Moraca-canyon (photo). In the first part I could enjoy only the clear blue-green coloured water, but after then the road was going on the side of 400-500m high rockwalls; the water was bubbled about 100m below me. I had to go through about 15 short tunnels. It was unbelievabe that that was the main road between Podgorica and Beograd. I met some lorries but the traffic was not so busy than on the climb after Petrovac. The thin valleys were about 1-5% steep. Sometimes there were about 30-40 meters between the two rockwalls. 50kms after Podgorica I arrived at a crossing; in the last few kilometers the valley was wider, I could see some nice and high mountains. This peaks was just in the Alps. In the next kilometers at about 8 pm.  with 137ks in my legs  I had to cycle 8 kms up to the 1045m high summit. I needed my last efforts and energy. Because in Kolasin I couldnt find either a camping nor a room to let and the motel seemed to be full (but we couldnt understand each other with the receptionist girl) I asked the boy from the opposite house if I could build up my tent in his garden for some money. He was fiendly and for my ask I also could have a shower. In the morning I wanted to pay for the night, but he didnt let it. 17th June: Kolasin  Biogradsko jezero  Kolasin  Podgorica  Meterizi = 136 km + 769 m heightdiff. After my last very hard day I planned a light one. I had already seen so many beautiful things that it seemed to be not a problem to miss the Tara-canyon. After 13km light roll-down I arrived to the exit-road to the Biogradsko National Park. I had read about it that its one of the three virgin forests in Europe. The climb was  for my surprise  only 4 km long, but 8% steep. I left my bike with the pack at a booth on the shore of the 1094m high situated lake, and then I went on a less than hour long round-trip around the lake. It seemed that the virgin forest started behind the lake; there I had to cross the marsh on thin wooden bridges. The plants, the flora lived free. There were a lot of water- plants, streams, ferns, mosses and I could hear a lot of birdvoices. The air was also humid. Back to Podgorica I cycled on te road I got known last day: through the Moraca-canyon. I couldnt not to stop for some photos, videofilms. From Podgorica I turned right towards the next nature-beauty I had read about in Hungary on the website of baraka: the Rijeka Crnojevica. Because I couldnt find other at last I asked a man about accomodation. He invited me, so I could build up my tent in his garden. We had a very good evening with a lot of speak, a little bit of brandy and he was such friendly that he made roast potatoes for me. 18th June: Meterizi  Rijeka Crnojevica  Virpazar  Petrovac  Budva  Jaz beach = 80 km + 1085 m heightdiff. The uncle started working in the garden at about 5 am, but it didnt disturb my sleep. I wanted to thank the opportunity to sleep in the garden but the uncle didnt let me to pay for it: We are such men, if the other needs help, we help him.  I had only good experiences with the people in Montenegro. Maybe they are poor, but very friendly and helpful. After some kilometers cycling I got a view to the Rijeka Crnojevica (photo), which is both a small river and a village too. It was so fantastic, as on the pictures: the untouched nature, the fresh green coloured plants, the riverbend and at left the Lake Skadar. Everywhere I could see everything was green: the mountains dark-green, the lake and the river light-green, the trees dark-green, etc. IT was a feeling, experience! The village was just like it could be at the end of the world, it could be about 50-80years ago. I could see only on 2-3 houses that they realized the opportunities of the turism. I went towards Virpazar through a little trafficked road next to the lake but on the sides of the mountains (photo). I had nice panoramas to the lake and the mountains. After Virpazar I had to bike up that 665m high pass I had already gone through last day. I arrived at Budva with feeling happy. I liked this small town. I bought some souvenirs for the people I like. In the evening clouds and storms arrived, it was the first more than hour long rain through my tour, and only the second rain. Because the storm that came back twice I didnt have a peaceful night, I slept only about 4 hours. 19th June: Jaz beach  Tivat  Hervegnovi  Srebreno  Dubrovnik  Srebreno = 102 km + 700 m heightdiff. In the morning about 10-11 am. the clouds started to break, it was hardly raining and because of the ship-route next day I had to arrive at Dubrovnik this evening, I had to sit in the saddle and push the pedals. I was cycling on a light ascent and then a descent to Tivat, where I crossed the channel by a ferry. It goes through in every quarter an hour. The ferry was free for the bikers and for the pedestrians. On the road I knew there was nothing to stop about. I was pushing the pedals a little bit tired, and after the border unfortunately the wind found me. I couldnt be angry because I knew that whether against wind, or without it I would reach my camping 5kms before Dubrovnik in a short time. The camping of Srebreno was good for me, I knew it. In the afternoon I had time to look around in Dubrovnik again. My main goal in this atmospheric town was to buy souvenirs for me and for the people who were waiting for me at home. In the town I found the port, from where my ship would start next morning 9 am. This evening I found Dubrovnik wonderful again. I fall in love with this town too. 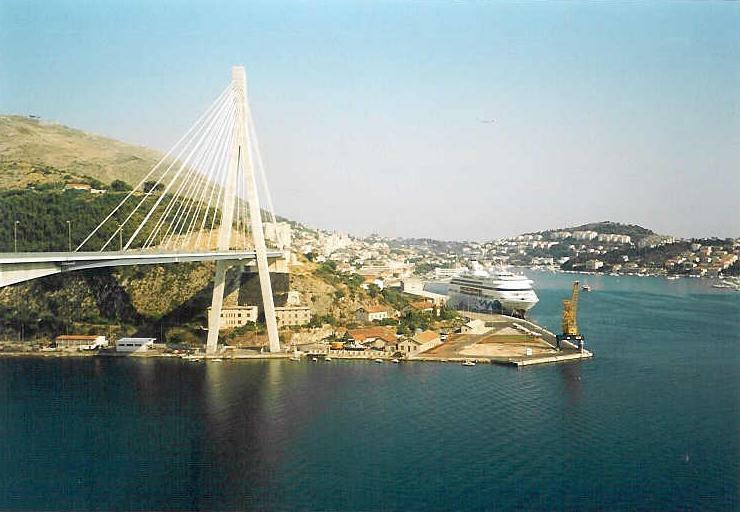 - Montenegro is not so busy than Croatia, but there are busy places. - You can find a lot of things in the shops, but not everything. I missed the delicious bakerwares. Its not sure that you can phone from here, you have to inform at the mobilephone-campany. 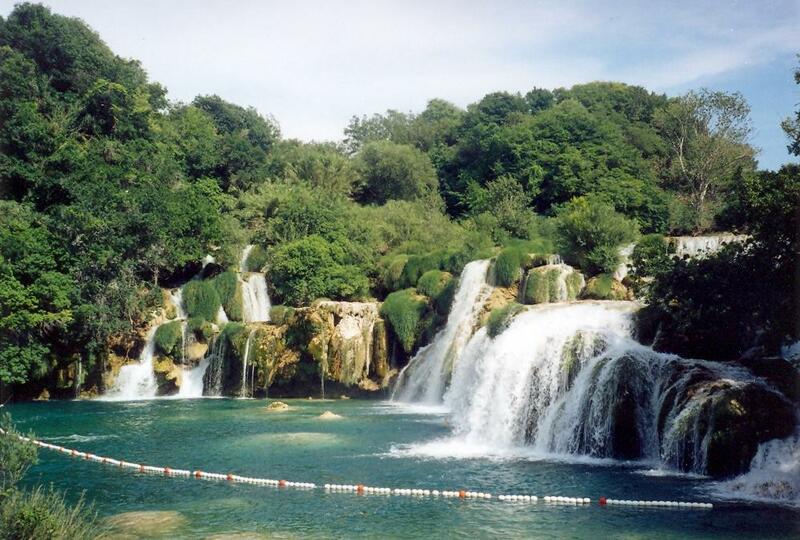 - Campings: There are not too many campings in Montenegro, you should inform about it from other tourists. Along the beach there are accomodations in houses, but in the mountains I think you would hardly find any. - Places you shouldnt miss: Kotor and the serpentineroad, Jaz beach, Budva, the Moraca-canyon and Rijeka Crnojevica (there are roads from the village towards Virpazar and towards Brezine. After a windy night I woke up for a clear morning. To the port I had to cycle half an hour on a panoramic road on the montainside. I had the information that I had to check in at 7 am, but really the check in started about an hour later. The ship started its 22 hour lonf trip from Dubrovnik to Rijeka  with a lot of car and tourists in it  at 9 pm. On the deck there was a lot of tourists, most of them german. It was no accident, because we continuously panorama to the sea and the islands. A large number of the tourists had photomachines or videocameras. I aslo took photos and videofilms. About 11 am Ive heard the guide when he said to the tourists to smear sunoil on their body because of the sunshine. Then most of the tourists started smearing in 10 minutes. In Korcula a huge number of the tourists got off, and less get on board. I saw there more tourists than a week ago, when I cycled there. Next we stopped in Hvar island, then in Split. It was interesting to sail between the known islands, to enjoy their beauty and the feeling that I had been already cycling along the shore of the Adriatic. The visited towns followed each other. 1-2 hours after Split I enjoyed the sunset on the sea. It was an experience how the lighted ship ploughs through the sea, as on the film, Titanic. The ship waved only a little bit on the sea. Because I hadnt reserved a room, and I didnt want to bring my polifoam, I leant onto the table and succeded in sleeping 5 hours in 3 details. TOTAL: 2257,98 km + 19588 m heightdiff.